The West African state of Nigeria, currently considered Africa’s largest economy, has, in the north-east of the country, been under sustained attack by an armed, radical Islamist movement, until recently known as Boko Haram. “Boko Haram” is the popular name for the “Sunni Community for the Propagation of the Prophet’s Teaching and Jihad.” The birth and growth of Boko Haram was—and has been—shaped by a combination of covert foreign interference, poor governance, corruption, infrastructure neglect, extreme poverty, and the rapid rise of a fundamentalist Wahhabi theological system that opposes the generally tolerant Islam practiced by the traditional northern Nigerian establishment. However, Boko Haram has exploited the loss of hope to influence and bolster its forces. It shows no interest in actually governing, developing the economy or improving the standard of living of those living under its ‘rule.’ Instead, having pledged its allegiance to the Middle Eastern terror group known as the Islamic State of Iraq and Levant (ISIL), it recently rebranded itself as the Islamic State West Africa Province (ISWAP). It has made—and continues to make—extensive use of ISIL’s social media assets and remains known as “Boko Haram” to most West Africans. Claiming that it is fighting to abolish Western culture and impose its own brand of Sharia law on its ‘subjects,’ it has overtaken ISIL as the world’s bloodiest and most vicious terrorist movement, spreading its campaign across regional borders. It is currently being hunted by a five-country coalition consisting of Nigeria, Benin, Cameroon, Chad, and Niger, which is supposedly supported by the United States, the United Kingdom, and France. However, this has not deterred Boko Haram from carrying out its actions of indiscriminate suicide bombings, mass kidnappings, and massacres against the local populace in north-eastern Nigeria and its neighbors. By late-2014 the government of President Goodluck Jonathan was facing a crisis as the largely foreign-trained Nigerian army units that faced Boko Haram had consistently failed to halt the terror movement’s offensives and had developed a reputation for fleeing the battlefield while abandoning their equipment. The impact on the morale of both the nation and the armed forces as well as the sustained terror and murder facing the local population in north-eastern Nigeria forced the government to take drastic action. It was the failure of the army—along with the United States’ refusal to sell much needed military equipment to Nigeria—that ultimately resulted in President Goodluck Jonathan telling the US military trainers to leave Nigeria. It can be argued that the focused drive to Balkanize oil-rich African states commenced with the Western-engineered and led collapse of Libya under the guise of bringing about ‘democracy’ and ‘freedom.’ Chaos instead of democracy arrived and it gave Boko Haram a substantial boost as the floodgates opened on the large Libyan military arms depots, many of which—using traditional trade routes—found their way to Nigeria’s Boko Haram. Nigerian Islamists fighting to effect regime change in Libya, and who had been supportive of the Western intervention in Libya, also began returning home to Nigeria, armed with experience in terror actions. If anything, Libya served as an encouragement to returning Boko Haram terrorists who viewed themselves as ‘victorious’ in their quest to topple Libya’s leader, Colonel Muammar Qaddafi. Despite the atrocities committed by Boko Haram, it was reported that “covert financial support as well as military training has been channeled to Boko Haram by two of America’s staunchest allies: Saudi Arabia and the UK.” It was only on 13 November 2013 that the United States reluctantly declared Boko Haram a terrorist organization. Furthermore, Boko Haram has close ties to two Al-Qaeda affiliated organizations, namely Al Qaeda in the Islamic Maghreb (AQIM) and the Libyan Islamic Fighting Group (LIFG). Both of these organizations were covertly supported by Western intelligence organizations and NATO forces during the war to effect regime-change in Libya. More recently, Boko Haram has reached out to the Islamist group in Central African Republic known as Seleka as well as to Al-Shabaab in Somalia and the Islamist Allied Defence Force in Democratic Republic of Congo (DRC). Whereas the initial intention of the United States and its allies in supporting Boko Haram may have been to destabilize Nigeria, trigger sectarian divisions and violence, and then rush in to ‘save’ Nigeria under the banner of military assistance and humanitarian aid, reality has dictated otherwise. Boko Haram has continued to spread its tentacles of terror and has engulfed an entire region in conflict, and killed, maimed, kidnapped, and displaced thousands of people. It has additionally worked at spreading its influence and expanding its arc of instability across an entire region. In mid-April 2014, Boko Haram staged a mass school kidnapping in the town of Chibok in Borno State. Although some of the school girls managed to escape, a total of 219 girls—eventually referred to as the ‘Chibok girls’—were taken hostage. This resulted in an international outcry and numerous ‘save the girls’ campaigns, but little concrete action was taken other than empty rhetoric. Despite United States and United Kingdom intelligence services knowing where the missing girls were being kept, this intelligence was not shared with the Nigerians, as the West did not trust the Nigerian troops it had trained to conduct a rescue operation. All attempts by the Nigerian army to locate and rescue the girls failed—despite US training and support—and Boko Haram grew in reputation and confidence. At some time during 2014, Eric Prince, the founder of Blackwater, travelled to Nigeria where he met with then-President Goodluck Jonathan. According to reports, he offered to destroy Boko Haram for a fee of US$1.5 billion. That offer was rejected. As the 2015 general election loomed closer, the ruling People’s Democratic Party (PDP) of Nigeria made a conscious decision to reject all foreign military assistance and instead, contract a Private Military Contractor (PMC). A prime contractor was appointed who, in turn, looked towards South Africa for an answer to the Boko Haram question. Special Tasks, Training, Equipment and Protection (STTEP) International Ltd. STTEP is a South African PMC that has worked across Africa and has extensive experience in advising, training, and mentoring African armies in combating armed anti-government forces. Its record is both unblemished and unparalleled. Drawing its manpower primarily from both the pre-1994 South African Defence Force (SADF) and the South African Police’s Task Force, as well as the armed wing of the opposing African National Congress’s (ANC) Umkhonto weSizwe (MK), STTEP comprises members of both African and European decent and is viewed by numerous African governments as a true African PMC that provides African security solutions to under-siege governments. Despite claims to the contrary, STTEP was initially contracted to train a hostage-release team for the Nigerian army to rescue the Chibok girls held captive by Boko Haram. This mission later transitioned into an offensive role in order to halt Boko Haram’s rapid advance and create breathing space to enable the government to hold elections. Indeed, Boko Haram’s actions instilled fear not only in the local population but also in the army units facing them. This resulted in numerous army units being overrun and withdrawing from the engagement areas, leaving valuable equipment in their wake—equipment Boko Haram would later use in its terror campaign. Poorly trained and lacking actionable and credible battlefield intelligence, the Nigeria units facing Boko Haram were also poorly equipped, lacking in morale, and lacking both air reconnaissance and air support. This resulted in the Nigerian forces applying predictive tactics unsuitable to both the terrain and the threat. Intelligence gained from aerial surveillance operations conducted by US and French forces in the region was only made available 24–48 hours after the fact. This further compounded the difficulties the Nigerian forces had in initiating any proactive actions in countering the Boko Haram threat. Unable to pre-empt Boko Haram actions, along with an outdated and unsuited doctrine and little or no real political will to halt and strike decisive blows against Boko Haram, the combat units were denied maneuver options and were unable to apply attrition actions against Boko Haram with direct and indirect delivered fire. Arriving in Nigeria in mid-to-late-December 2014, STTEP’s trainers were dismayed at the level and standard of training the Nigerian troops had received from their foreign trainers. As described in the press, “The foreigners failed in their foreign internal defense missions due to ‘poor training, bad advice, a lack of strategy, vastly different tribal affiliations, ethnicity, religion, languages, cultures, not understanding the conflict and enemy,’ Barlow told SOFREP. ‘Much of this training is focused on window-dressing, but when you look through the window, the room is empty.’”Boko Haram’s actions instilled fear not only in the local population but also in the army units facing them. This resulted in numerous army units being overrun and withdrawing from the engagement areas, leaving valuable equipment in their wake—equipment Boko Haram would later use in its terror campaign. Although STTEP was initially contracted to train a hostage-release team to rescue the Chibok girls, the mission was changed as Boko Haram’s offensive continued to gain momentum. The new mission called for the establishment of a unit that would be able to take the fight to Boko Haram—and win. This unit would become known as 72 Mobile Strike Force (MSF) and would become the spearhead for the 7 Infantry Division based at Maiduguri, north-eastern Nigeria. After a brief selection phase, the selected Nigerian troops were hurriedly and rigorously retrained in numerous military arts such as musketry, field-craft, combat medical aid, communications, mounted and dismounted maneuver, and pursuit along with the application of direct and indirect fire. Numerous doctrinal adjustments and changes were made to allow the unit to operate as an unconventional maneuver force that could rapidly deploy across the harsh terrain it would conduct operations in. Due to a dire situation facing the country and the looming presidential elections, STTEP was only given a two-month period in which to train and prepare the unit and with the minimum of equipment. The equipment included a number of Mine Resistant Ambush Protected vehicles (MRAPs), a handful of heavy machineguns, and a few light mortars with minimal communications equipment. Night vision equipment and thermal imagery systems were notably lacking. The strike force would later be joined by a pair of armed Gazelle helicopters, four utility helicopters, and a single Mi-24 attack helicopter. Despite lacking both time and equipment, the training was completed and the under-equipped unit hastily deployed to Maiduguri. It was also decided to deploy STTEP personnel alongside the newly-trained Nigerian troops to boost their confidence and morale as well as to monitor the application and effectiveness of their training. Senior STTEP personnel would act as the leader group for the force as well as interface with the headquarters of 7 Infantry Division to ensure that the strike force operated in support of the operational intent of the General Officer Commanding, 7 Infantry Division. The new doctrine allowed the strike force some operational flexibility and initiative. It was also decided that the strike force would not take and hold ground but rather make use of follow-on forces from 7 Infantry Division to reoccupy terrain recaptured from Boko Haram. This decision would free-up the MSF to continue striking Boko Haram targets. While the training was taking place, STTEP deployed its own intelligence cell to Maiduguri where it began cooperating with the intelligence elements of 7 Infantry Division. The mission of the intelligence cell was to provide current and actionable intelligence to the MSF as well as prepare detailed target assessments of Boko Haram targets. The retrained Nigerian troops of the newly-formed 72 MSF were soon to prove that despite the negativity surrounding them, they were, once properly trained and correctly led, more than a match for Boko Haram. Key to their success would be the concept of relentless offensive action. On arrival at Maiduguri, 72 MSF was forced to await the arrival of some of its critical combat equipment. The force also had no base area in Maiduguri and had to construct its own base whilst simultaneously readying itself for battle. Furthermore, it had no armored fighting vehicles, no rocket artillery, very little ammunition for its heavy machineguns, and was lacking in inter-vehicle radio communications. What it lacked in terms of equipment and weapons, it made up for in fighting spirit and morale. Whilst the force was preparing to enter into combat with Boko Haram, its two Gazelle helicopter gunships conducted numerous daylight and nocturnal patrols, attacking and destroying numerous Boko Haram assembly areas, concentrations, and technicals. These air attacks degraded both Boko Haram’s force levels and morale. In January 2015, Boko Haram conducted numerous acts of terror against the local populace in the Mafa area; the survivors fled to Maiduguri in large numbers. The force deployed on its first combat mission in late-February 2015 and its target was the town of Mafa, approximately 57 kilometers west of Maiduguri. The MSF retook Mafa and exploited to a distance of approximately five kilometers west of the town. The follow-on units of 7 Infantry Division occupied the town shortly thereafter and the 72 MSF returned to Maiduguri where thousands of citizens lined the streets to cheer the force on its success and return. While plans were being made to recapture Bama and Gwoza, two large Boko Haram strongholds, the MSF’s helicopter gunships continued flying ‘locate and strike’ missions and a small helicopter-borne force conducted numerous stand-off mortar bombardments on known Boko Haram positions. During a night advance and link-up operation for the strike on Bama, a Nigerian Army T-72 tank shot out a MSF MRAP, resulting in two MSF combat casualties. This so-called ‘friendly fire’ incident resulted in the attack on Bama being postponed. Forty-eight hours later, the MSF conducted its strike on Bama, recapturing it from Boko Haram. The follow-on forces of 7 Infantry Division rapidly occupied and cleared Bama and held it against any possible Boko Haram counter actions. One of the last MSF intelligence cell reports to the Department of State Services (DSS), Nigeria’s domestic intelligence service—also known as the State Security Service—outlined the probable future actions of Boko Haram. This report predicted that the weakened Boko Haram would shortly revert to ‘suicide bomb’ attacks to compensate for their degraded military capability. It also recommended that future intelligence operations should include the infiltration and identification of the predicted suicide operation centers and bomb making facilities. STTEP’s personnel left Nigeria shortly thereafter as the end of the Goodluck Jonathan era coincided with the end of the STTEP contract. The incoming government of President Muhammadu Buhari was under pressure not to reengage STTEP. Instead the United States expressed its interest in returning to Nigeria and resuming the training of the Nigerian forces. The Nigerian conflict provides numerous valuable lessons to be learned, lessons that remain applicable to both Africa and beyond. One underlying lesson of most African conflicts is that large armies fight small wars badly. Most conflicts are the result of a failure of governance and the rise of popular anger and dissatisfaction. However, it is not the resultant poverty that gives rise to armed anti-government forces but rather the populace’s loss of hope. When the loss of hope is used alongside religion as the glue to hold anti-government forces together, it can become a major threat to a government. When these forces resort to terror tactics, it can impact an entire nation and the region. National strategies, national security strategies, and national military strategies are often outdated and based on faulty intelligence and rumors as opposed to credible and verified intelligence. These strategies are seldom reassessed and adapted to cope with a changing threat environment. The nature of the threat and type of conflict being fought must be fully understood before it can be effectively countered. A regional threat and conflict can result in the uncontrolled migration of displaced persons. The uncontrolled movement of refugees provides excellent cover for hostile elements to infiltrate an area and conduct further anti-government operations. So-called refugee camps also provide a fertile breeding ground for further dissatisfaction towards the government and its people. The failure of the intelligence services to identify a growing threat and the inability of law enforcement agencies to contain the developing threat in its embryonic stages adds momentum to the growing danger. Similarly, a lack of current, actionable, and predicted intelligence hampers the development of sound strategic and operational options whilst giving the threat forces an excellent opportunity to achieve both strategic and operational surprise. Without intelligence, the forces are blind. Most African armies are incorrectly structured and simply follow the organizational structure of their pre-independence rulers or their Cold War allies. This makes them unable to fight with agility, flexibility, speed, and rapid maneuver. The tables of organization and equipment (TOE) of a European army cannot be used as a template to structure an African army. An incorrectly structured army, utilizing an ineffective and outdated doctrine, gives any threat-force an advantage whilst placing itself at a disadvantage. Equipment shortages hamper training programs and reduce an army’s ability to exploit fire and maneuver. An army unable to apply both horizontal and vertical maneuver and use fire to cause attrition of the enemy will remain on the defensive. Tactics are dictated by terrain. As terrain changes, so too must tactics. Command and control must be decentralized to the lowest level. This enables rapid battlefield decision making and adds to the initiative of junior commanders. Effective radio communications are essential to ensure the rapid issuance of orders and instructions. Without effective battlefield communications, there can be no battlefield coordination, relentless offensive action, and effective command and control. Combined arms training is essential on the modern battlefield, regardless of the type of conflict being fought. Coordinated direct and indirect fire, supported by rapid horizontal and vertical maneuver, executed with speed and surprise are the keys to success to any combat operation. Night operations, both air and ground, are essential to wrest the initiative from the enemy and add to the army’s momentum and operational tempo along with relentless pressure on the enemy. Discipline, pride and training is the glue that holds soldiers, sub-units, units, and formations together. Training must be tough and mission-specific. Despite only a three-month contract and amid numerous media attacks on STTEP and its engagement in Nigeria, during one month’s operations, the 72 MSF recaptured a land mass larger than Belgium from Boko Haram. However, as STTEP’s chairman, I issued this stark warning to the Nigerian army, “The enemy was not annihilated and was able to flee the battlefield with some of their forces intact, and will no doubt regroup and continue their acts of terror to enforce their political and religious philosophy. The ending of Boko Haram will be political and economical in nature, as you cannot kill an aspiration.” This warning was ignored and soon after STTEP’s departure, Boko Haram resumed its offensive posture and the Nigerian army again started losing ground to Boko Haram. Although newly-elected Nigerian president, Buhari, promised the Nigerian people that he would destroy Boko Haram by Christmas 2015, his promises—along with a renewed US training and support effort—have sadly yielded very little in terms of success. 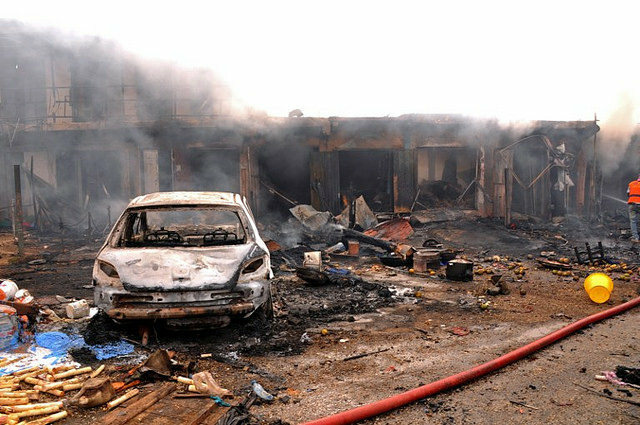 Nigeria remains in a state of conflict and suicide bombings continue. However, Nigeria provides numerous important lessons that, if not heeded, will simply prolong the conflict and suffering of the populace in the affected areas.